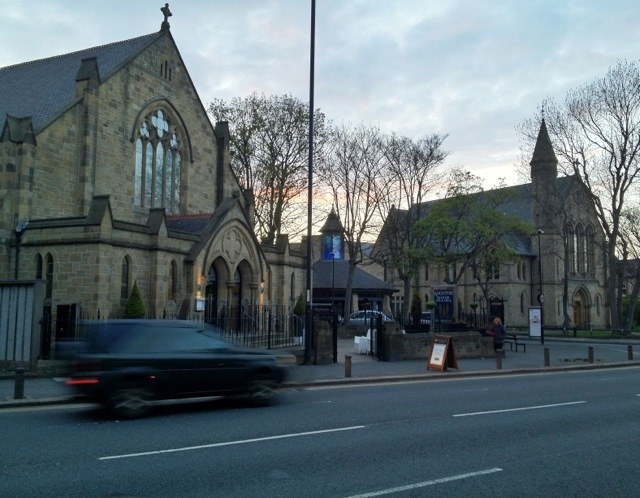 Gosforth High Street features these two Victorian churches next to one another: a quite remarkable sight! The church on the left of the photo is now a Loch Fyne seafood restaurant. It used to be Gosforth United Reformed Church, but in 2000, merged with two Methodist churches – one of which was the church on the right of this photo – to form the Trinity church, in the church on the right. Are you still following this story? As an atheist who doesn’t like seafood, neither of the two buildings is especially likely to attract me. It seems fascinating that two branches of Christianity that were so split that they’d bother to build competing churches next to each other have now resolved their theological differences to such a degree that they’ve merged. Heigh ho, religion works in mysterious ways, and it’s always nice to see people patching up differences! This 1,601st post was filed under: Photo-a-day 2012, Christianity, Churches, Religion.